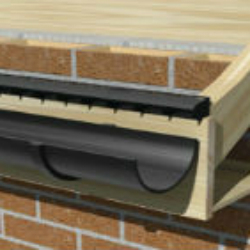 Fascia vents provide a high volume of continuous air flow by creating a uniform air channel between the top of the facia board and the roofing felt. Suitable for most roof refurbishment or installation on new buildings. Venting often works best when installed along the full length of the eaves and combined with venting along the ridge line - ideally through the use of continuous vent roll or dry ridge system. One of the big advantages of over-fascia, eaves ventilation is its neat, discreet appearance. Along with its low cost, easy installation and maintenance-free operation, it’s easy to see why this type of ventilation is becoming increasingly popular. Most fascia vents also incorporate a comb, baffle, or small air-holes that prevent birds, wasps and other large insects from entering the roof through the air gap.